world may know that he has at length become a man. Here is another of the photographs found in Montana. My son selected it because he thought this group of young men were trying to look tough. I'm not sure that's what they intended. I think they may have thought they were sophisticated. Notice those odd shaped cigars sticking out of a few of their mouths. The mark of a gentleman? Hard to say. three cigars and perhaps a cigarette. I show you these young men, because while wandering the web I found The Smoker Collection. This is a collection of 112 19th Century albumen photographs, cartes de visite (CDVs) and tintypes depicting the practice of smoking in many different cultures. The collection was amassed over two decades by Richard Segan, an avid collector who, it is said, aggressively pursued these images. The collection is for sale for $111,000.00. Yes, you read that correctly, 112 rare photographs for $111,000.00. Personally, I would have liked to have seen less foreign cultures and a few more depicting U.S. smoking history. You can view the images here. Greg French, the owner of the Early Photography website offers some suggestions for utilizing the photographs that he believes should make their monetary value limitless. Take a look, there are many wonderful photographs to be viewed on this site. Do you have a 19th Century photograph related to smoking? Let's put together our own Smokers Collection. Send your photographs to Shades via the footnoteMaven and we will feature them. It does make me wonder, however, just how much those women wearing glasses might be worth. *Drinking Smoke - A term used to signify "smoking." Also referred to as "drinking tobacco." 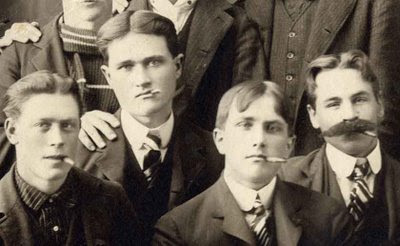 Young Men Smoking. ca 1908. Card Mounted Photograph. Anonymous. Privately held by the footnoteMaven, Preston, Washington. 2009. So, it seems, we have always been a nation that runs to "the next best thing." Fortunately time allows us to take a longer look with a more critical eye. Why they became popular, why their popularity died. So it is with photographers. New York has given us some wonderful photographers, including my favorite, Abraham Bogardus. Evidence of New York's fickleness of taste is found in the case of photographers. None of them remains in vogue more than a few years. The average term of maximum popularity for a photographer is put at about eight years. For that time he may be the most popular artist in his line. Then others will arise and take his place. Nobody has ever been able to explain just why one photographer suddenly becomes popular and seems for awhile to be the only one to whom New Yorkers go. Sometimes photographers come to New York from other cities, in which they have made a reputation. In other cases, they spend years in obscurity here and then are suddenly fortunate enough to attract favorable attention and become the fashion. Then their success is assured. Not all the photographers who drop out of view cease to find the business profitable. Their large earnings come, of course while they are on the top wave of success, but in many cases' they retain their clientele, in part. In some cases, however, they disappear from the horizon altogether once they cease to be the fashion. This experience befell a photographer with a foreign name who opened an atelier here several years ago. His French wife had been maid in a wealthy family here and he was able to. exhibit some well-known society women in the first showcase he put out on the avenue in front of his shop. He was the first of the photographers to pay especial attention to the dress of women. The women photographed by him all looked smart, although they also looked as much like one another as two peas. All the distinguishing lines in the face were eliminated and all the women were smooth, smug and extremely modish-looking. For nearly five years that photographer had the largest patronage among the wealthy of any in town. After a while the turn came and he disappeared altogether. He was popular for only a short time, because there was really no merit in his pictures. He had the knack of making his women subjects look high bred and well dressed, but that was the sum of his merits. Even society could not long make a favorite of him under such circumstances. Men was the specialty of another photographer who was very much the rage here for a while. Then he was suddenly dropped altogether and returned to England after trying to compel his former clients to buy the plates of their photographs. This photographer nearly always posed his clients under a palm whose leaves fell gracefully over their heads. It was the palm leaves that finally caused his loss of popularity. His patrons grew weary of the sheltering palm, and as he could take them no other way he had to shut up his studio. Of the two photographers that stood fifteen years ago at the head of their profession one has retired altogether from business without even selling his name to a successor, and the other has retired and turned his business into a stock company. All the prominent photographers now are newcomers. One of the most popular is the widow of a Belgian who came here several years ago and died after he had built up a large business, which his wife now carries on. Another is an American who began in London and came here three years ago. He devotes himself to highly artistic- pictures and had a hard time to make his pictures popular at the outset. Now he is on the top wave of prosperity. 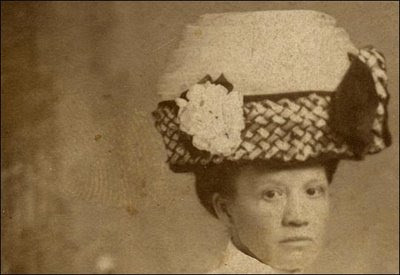 A woman who finds her pictures very much in demand was for years a milliner until she had accumulated capital enough to start in business as a photographer. St. Louis and Canadian Photographer. "New York's Fickleness In The Matter Of Its Pictures." January 1907. Sarony, Napoleon, photographer. 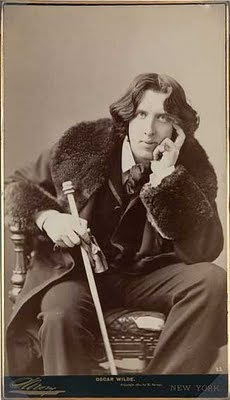 "Oscar Wilde." Cabinet Card. New York, c1892. Library of Congress Prints and Photographs Division Washington, D.C. http://hdl.loc.gov/loc.pnp/ppmsca.07757 (accessed June 24, 2009). Bogardus, Abraham, photographer. 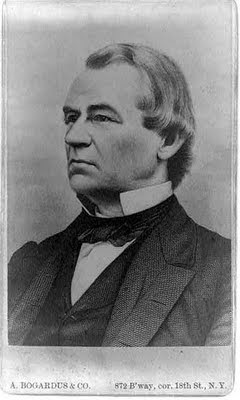 "[Andrew Johnson, half-length portrait, facing left.]" Cabinet Card. New York : A. Bogardus & Co., [between 1865 and 1880]. Library of Congress Prints and Photographs Division Washington, D.C. http://hdl.loc.gov/loc.pnp/cph.3a32470 (accessed June 24, 2009). This weekend Craig Manson takes a much earned Sunday away from the computer. Craig will return in August with a very special Appealing Subjects; one that contains a twist! Stay tuned. 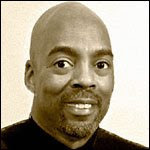 Today please read and revisit Craig's article published for Friday From The Collectors. Have you seen her copyright notice? This week, I'm reading papers written by my public policy students. They could choose just about any topic and propose a change in public policy concerning that topic. Curiously, three of twenty-four of them wrote about issues concerning copyright in this so-called digital age. So I have been pondering their musings with respect to the Copyright Act of 1790 as well as the Digital Millennium Copyright Act. And as I have thought about it--no disrespect meant to these outstanding students--there's really nothing new about these issues. At the root is the age-old problem of our public policies lagging behind our technological abilities. Other than hearing the songs I listened to in high school on the “oldies” station, the one thing that truly makes me feel old is not being understood by children. It happened one day while out on a drive with my nieces. We passed a tiny shack on the side of the road that sold water ice, and they found it hysterical because it was so small. “It looks like a Fotomat!” I exclaimed. No recognition appeared on their faces. “A what?” asked the 13-year-old. “You know, the little Fotomat huts…” But then I realized – no, she doesn’t know. By the time she was born, Fotomats were already a thing of the past – as extinct in the photographic world as daguerreotypes and box cameras. It was time for a history lesson. Thank you to Lisa Louise Cooke (Genealogy Gems Podcast & Genealogy Gems News) for inviting me to be a guest on her podcast to discuss Shades of The Departed. 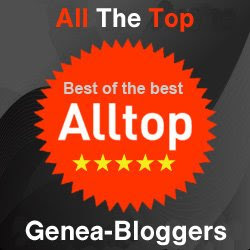 The interview is today's post and podcast entitled Genealogy Blogging Wisdom: Be Youself - Everyone Else Is Already Taken. Lisa is an extremely skilled interviewer. She has the ability to put you at ease, become your best friend, and convince you you're just hanging out and getting in some girl talk; in the space of a few short minutes. That's real talent! It was my privilege to spend some time with Lisa. She is as beautiful on the inside as she is on the outside. Shades is where my heart is and I think you'll realize that when you listen to Lisa's very skilled interview. Thank you, Lisa, for allowing me to talk about a place in my heart. Yes, Put On Those White Gloves, Baby! Much of the damage to photographs and negatives is caused by chemical reactions of the body oils in fingerprints with the image during the handling process. Wear white cotton gloves to lessen the possibility of leaving fingerprints and soiling the photograph. Shades has stated this admonition on more than one occasion. Have you ever seen a fingerprint that could be 100 years old? I thought I'd introduce you to one today. Here is the reason you wear white gloves. Here is a fingerprint burned into the Real Photo Postcard used in my article A Sign Of The Times. The postcard was produced ca. 1911. The fingerprint was the product of poor handling procedures sometime between 1911 and the date it was received by Shades in 2009. -- Handle a photograph while wearing lint free white gloves. -- Never touch the photograph itself. Always handle a photograph by the edge. -- Remove bits of cardboard or debris from your gloves between each photographic examination. -- Wash gloves after every use. So put on those "white gloves, Baby" and be confident you won't get an oily fingerprint in the middle of Great Grandmother's pretty face. Yes, the candlestick telephone was a sign of the times and in this Real Photo Postcard it acts as the photographer's prop. "After the invention of the telephone in 1876, the candlestick (or desk stand) was manufactured from the early 1890's through the 1920's. During this period there were hundreds of independent phone companies and even more unique candlestick phones in production." Now how do I know it's a prop and not the telephone of the young woman pictured? Research, plain old fashioned research. This is a Real Photo Postcard (RPPC), as previously discussed in Big Wheels and Sometimes Main Street Is The Whole Town. The way you tell the difference between an RPPC and a printed post card is to look at the card under a magnifying glass. If the photo is printed, you will see that it is made up of a lot of little dots, the same as a photo printed in a newspaper. A Real Photo Postcard is solid, no dots. This post card is solid no dots. Here is the information contained on the back of this postcard. As this post card is postally used, we have the benefit of a postmark. This post card is in very poor condition. The author of this postcard, Ella Rouse, has handwriting that is very difficult to read. 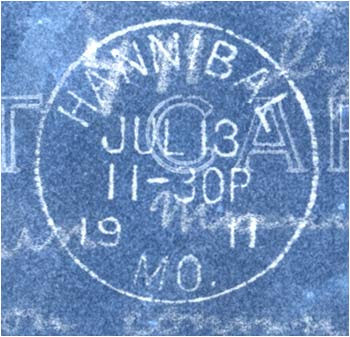 The postcard was mailed from Hannibal, Missouri to Columbia, Missouri on July 13, 1911 at 11.30pm. The recipient is Marrial/Marrie Davidson. This sentence is questionable: I read of W. R. Brown Storm. This is my best guess and would appreciate other interpretations. 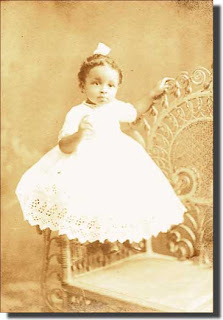 Ella Rouse is listed in the 1911 Census for Hannibal, Missouri, as the twenty-three year old wife of Joseph Rouse. This is a second marriage for sixty-three year old Joseph; Ella's first. Living in the home with Joseph and Ella is Joseph's seventeen year old daughter Cordelia. This is most probably the Cordelia mentioned in the postcard. The Polk Directory for 1911-1912 for Hannibal, Missouri, lists Joseph and Ella Rouse as residents. The directory contains the telephone numbers for residents and businesses. There is no telephone number listed for the couple for 1911-12. It is my assertion that the absence of a telephone number in the directory translates to Joseph and Ella not having a telephone. 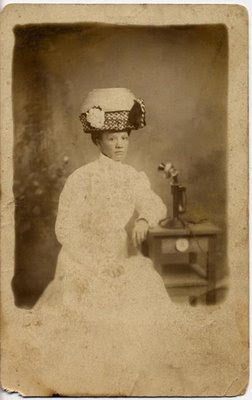 I believe the candlestick telephone shown in Ella's photograph is a studio prop. The recipient of the postcard is more difficult to determine. 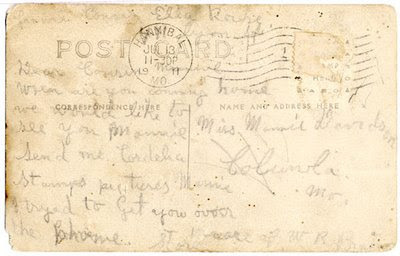 From the postcard it appears that Marrial/Marrie Davidson is visiting in Columbia, as Ella asks her cousin when she will be coming home. I have assumed that Ms. Davidson was a resident of Hannibal. The 1910 censuses shows a Marri/Marre Davidson living in Hannibal in 1900. She is the same age as Ella Rouse. The census was enumerated between 17 and 28 April 1910. There is a Marle Davidson living in her permanent residence at the same time in Columbia, Missouri. There is insufficient information to determine if any of these woman are the recipient of the postcard. On the other side of the state, in Kansas City, Missouri, in 1891, lived the inventor of the automatic telephone exchange and the telephone dial seen on the candlestick phone pictured above. Almon Strowger was an undertaker whose business was losing clients to a competitor. Strowger discovered his competition for undertaking business in town had a wife who was a telephone-operator. When potential customers asked the operator to connect them with Strowger's business she would redirect everyone to her husband's undertaking business. Strowger's complaints to the telephone company went unanswered. It is said he went to his basement and constructed a model of his automatic system from a round collar box and some straight pins. 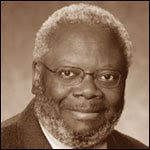 He patented the automatic telephone exchange in 1891. A Sign Of The Times, from a simple postcard so much information. Big Wheels - President Theodore Roosevelt and Family. Papa Can You Hear Me - A young girl in Montana looks for her father. From A Simple Postcard - Grace Mathewson and her collection. Anonymous. Ella Rouse. Real Photo Postcard. 1911. 1910 U.S. census, Marion County, Missouri, population schedule, Hannibal, p. 75, dwelling 314, family 337, Joseph Rouse (Head); digital images. Heritage Quest (http://persi.heritagequestonline.com/ : retrieved 10 July 2009); citing NARA microfilm publication T624, roll 798. 1910 U.S. census, Marion County, Missouri, population schedule, Hannibal, p. 121, dwelling --, family --, James F. Davidson (Head); digital images. Heritage Quest (http://persi.heritagequestonline.com/ : retrieved 10 July 2009); citing NARA microfilm publication T624, roll 798. 1910 U.S. census, Boone County, Missouri, population schedule, Columbia, p. 177, dwelling 302, family 228, Charles O. Davidson (Head); digital images. Heritage Quest (http://persi.heritagequestonline.com/ : retrieved 10 July 2009); citing NARA microfilm publication T624, roll 770. Librarian. Hannibal Free Public Library. Telephone conversation regarding Polk Directory 1911-1912. July 21, 2009. Collector, The Telephone. The Telephone Collector.com. 2008. Just over a week ago saw the advent of a new genealogy based social media cyber watering hole; GenealogyWise.com. Membership has gone through the roof! That's amazing! We have all read, no doubt, those news stories about formerly looted (or otherwise questionably acquired) artworks being discovered in museums, and the litigation that ensues as former owners sue for their return. The case of the Bloch-Bauer Klimts or the ongoing dispute over Roman antiquities between the J. Paul Getty Museum and Italy are two such cases, and both of them hinge on a basic principle of collecting: provenance. Provenance is, quite simply, where something has been. Museums, libraries, archives, and other serious collectors record and research the origins and ownership histories of the things they own because of what these pieces of information add to their collections' value and integrity. Knowing the circumstances of a sculpture’s creation, who owned it and at what auctions it traded hands can prove (or disprove) its authenticity, and therefore establish its literal value. But this knowledge also contributes to a greater understanding of the object’s context in history and its significance beyond the information written on its pages or painted on its surface. Into each life some rain must fall. Well, the July 16 posting of Smile For The Camera was hit by a tidal wave. I wish I knew how it happened, but I don't. I can only apologize. This reminds me of one of my favorite Mary Tyler Moore shows. Mary was getting an award from the broadcasting community for a program she produced. She was having a bad hair day, she broke her foot and was in a cast, and had a cold complete with red nose. When she was called up to accept her award all she could say was, "I usually look so much better than this." Well, Smile usually looks so much better than the original post. When the topic of occupational photographs was selected for this Smile Edition I didn't think we'd see many submissions, but I'm pleasantly surprised at the quantity and quality of photographs that you searched for and used for your posts. I think this is my favorite Carnival. You have outdone yourselves presenting a very interesting and varied group of photographs depicting friends and relatives "Working Hard For The Family." From farms to factories and everything in between, they're represented here. Let's open the cover of this edition of Smile For The Camera's album of "They Worked Hard For The Family." 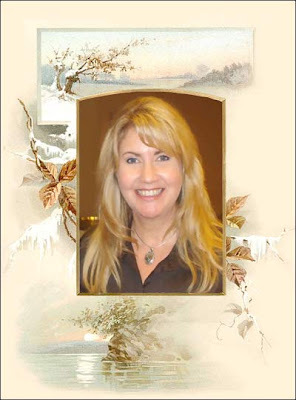 Debby, who is obviously the hardest working genealogist in Indiana, presents Debby's Indiana Genealogy posted at her blog of the same name. She says, "Not only did my grandfather work at the steel mill, he farmed. He died when my mother, his youngest, was only ten years old. Grandma received social security for the two youngest children. They were the first family in our county to receive this benefit." This is an amazing photograph of an occupation we've heard of but rarely seen. Thanks Debby! Diane's relative's occupation introduces us to the world of department store delivery in Phildelphia at Ding Dong, Strawbridge & Clothier calling... posted at Attic Treasures. Diane is very fortunate to have not one, but three very interesting and historical photographs. Becky Jamison of Grace and Glory introduces us to the Jones Home Laundry as they Work Hard For The Family. The story of a Depression era business that involved a 70 - 80 hour work week for Becky's step-mother. Hard times, hard work. Amanda presents They Worked Hard for the Family posted at A Tale of Two Ancestors. Amanda's great grandfather had the corner desk in his job with the Flying Red Horse. Amanda's also looking for the relatives of the other people in the photograph. Can you help? Jean Duncan introduces us to Firing Line Cars posted at Forget Me Knots: My Ancestors and My Ghosts, saying, "Keeping a fire going in stoves on a moving train with the purpose of preventing potatoes from freezing on the way to city markets from northern Maine was dangerous and dirty work in hard times for my great-uncle Harry." 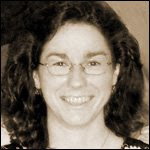 Jennifer Trahan presents They Worked Hard for the Family: Engineers and Blacksmiths posted at Jennifer's Genealogy Blog, saying, "My Pemberton ancestors hard at work as engineers and blacksmiths." Jennifer has some amazing photographs you must see! Bevely Harrison Huffman who authors A "Genie" In Arizona introduces her paternal grandfather in A Remembrance: Legacy of John P. Harrison & The Frisco Railroad. Beverly has a wonderful old railroad photograph and the story of working hard on the railroad for the family. Jessica Oswalt is the author of Working Hard: A Scene From the Early Days of the Automotive Industry posted at Jessica's Genejournal. Vauxhall Motors, Luton, Bedfordshire, England is the backdrop for the story of Jessica's great-grandfather. Make sure to select the photograph so you can see all the detail! Midge Frazel presents Victor Cleansing Co. posted at Granite in My Blood, saying, "You don't know the meaning of the word HOT until you have worked inside a business that is laundry and dry cleaning. So, why was this photo taken outside? Come see a unique work photo shared with me..."
Linda Hughes Hiser the author of the blog Flipside presents 15th Edition of Smile for the Camera—George Henry Hughes saying, "Forty-eight years at the same job and lovin it. Can you imagine!" No, not in this day and age. Evelyn Yvonne Theriault presents Smile For The Camera (15th Ed.) They Worked Hard For The Family posted at A Canadian Family, saying, "Not all Quebeckers came from France - some of my ancestors came here from the Channel Islands to work in the cod fisheries." I love Evelyn's postcards and her Festival. Donna Pointkouski who authors the engaging What's Past is Prologue posts He Worked Hard for the Family saying, "It certainly wasn't for the money..." You will love this photograph - when men were men and trucks were trucks! John Newmark presents Smile for the Camera: They Worked Hard for a Living posted at Transylvanian Dutch, saying, "In St. Louis, Missouri, El Paso, Texas, and Margitta, Hungary my ancestors and their relatives worked hard for a living." John never fails to deliver great photographs! Carol Stevens who authors Reflections From the Fence posted two entries to Smile. Her first "They Worked Hard For The Family" is a photograph of the Foundry in Broadway, Rockingham County, Virginia. And let me tell you how good a blogger Carol is; she contacted the family of the photographer for permission to post. Oh, Carol, there is a special spot in the footnoteMaven's heart for you. Great photo and copyright permission! Carol's second submission is a difficult story to read for in this one "Florence worked hard, and lost much." Henk van Kampen presents At work in the Museum Boekhandel posted at Roots. The museum Boekhandel in Amsterdam was a bookstore where Henk's grandfather worked. Three photographs give us insight into how he worked hard for the family. Stephanie Lincecum presents Lincecum Grocery posted at Lincecum Lineage, saying, "My great-grandparents had a life before I was born? No way! One of the many little stories of their life was operating Lincecum Grocery. It was supposed to be Lincecum & Son Grocery, but..." Quite an album, Stephanie! Earline Bradt presents Smile For The Camera 15th Ed. - They Worked Hard For The Family posted at Ancestral Notes, saying, "It is 1880 and the main means of transportation was the stagecoach. Keeping it going took more work than just hooking up a team and going for a ride, there were a lot of people who worked in the background, to get you where you had to go, from the cook who prepared the meals for the workers to the blacksmith who made the horseshoes." This is a fantastic photograph! Brett Payne presents Haymaking in Derbyshire at his blog the Photo-Sleuth, saying, "Having shifted a hay bale or two in my time, I can attest to haymaking being pretty hard work, even with modern machinery at one's beck and call. The thought of doing it all by hand, as this man is doing makes me want to live in the city ... well, perhaps not." I love the Photo-Sleuth, Brett and the blog, and he never fails to deliver quality posts! Randy of Family History Images has a wonderful photograph and post he calls One Ringy Dingy. And that's the only clue you'll get. Pop on over for a look at yesteryear you cell phone users. There are many interesting images to see at Randy's. Janet Iles, also known as Janet the researcher, gives us a glimpse of her father at work in Janet the researcher: They worked hard for their money - Smile for the Camera. She says, "I didn't go back far in my family to find a photo in my family albums of someone at work -- my dad. Here he and fellow workers smile for the camera at a local meat market. I leave talk of my ancestors' occupations for other postings." Geniaus gives us "images of Australians at work on their properties" in Downunder ..... they WORKED hard for the family posted at Geniaus. My only question. What is a sausage roll, for your American fans? Kay Bauman's submission Smile for the Camera -- Work, posted at Kay B's Place gives us some absolutely amazing photographs, an illustration of the family farm, and an exceptionally well researched and written article. Don't miss this one. Regina presents Smile for the Camera - Bringing home the beacon! posted at Kinfolk News: Random Thoughts and Research Notes, saying, "My second Smile entry, Yea!" From 1917 - 1973 Regina has a great collection of family occupational photographs. Oh, and Regina, Smile is glad to see you back! Paula Hawk has a photographic treat for you at Smile for the Camera ~ They Worked Hard for the Family posted at Corel Cousins. "The things I have recently learned about my great great grandfather are quite surprising. A farmer in Kansas may not sound like the most interesting job, but the life of James Henry Corel certainly had it's interesting points!" And its very interesting photographs. Wow! While Brian Massey's blog is called Ancestors At Rest his Smile submission demonstrates those ancestors weren't resting in Maxwell Factory In St.Marys Ontario. Is that a barrel making factory, Brian? Jasia presents 50 Years of Service at the Polish Daily News posted at Creative Gene. It was not only hard work to provide the community with the news, but typesetting was obviously dirty work. Vickie Everhart's digi-scrapbook work is so unique and beautiful. 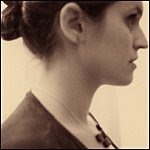 Here she has created something specifically for They Worked Hard For The Family at her Blog -- BeNotForgot. 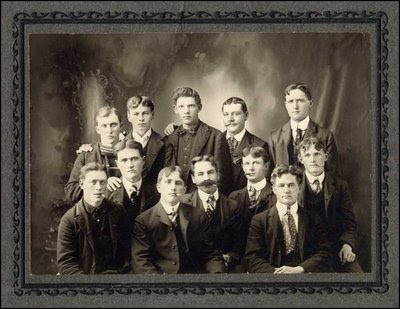 Vickie tells us, "The man in the lower left is my 2nd great-grandpa, Atwood F. Smith (1837-1907), who died of blood poisoning following an injury at work. In the upper right is his son, and my great-grandpa, Thomas Warren Alonzo Smith (1866-1920), who ran a landscaping & florist business in Biddeford, Maine. The woman is Eva Mae Smith, wife of T.W.A. Smith (& my great-grandma), who carried on for a while with the florist business following the death (by his own hand) of her husband of 25 years." M. Diane Rogers presents They Worked - Smile For The Camera - Beekeeping in Ontario Canada posted at CanadaGenealogy, or, 'Jane's Your Aunt'. This photograph is to die for and not to be missed. Diane, perhaps the local paper has written about Samuel and his occupation and this is a photograph to commemorate that. Frances Ellsworth presents A Great Example of Never Give UP posted at Branching Out Through The Years. A man who worked hard for and tried to please his family. 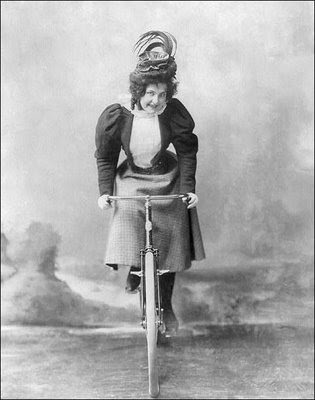 Through his efforts, Frances was able to make the college campus her playground. Wonderful photographs! Frances, with six children, where do you find the time? Becky Wiseman of kinexxions never fails to delight Smile with the photographs of her life. This time Becky shows us the family business in She was the chief cook, I was the dish washer. Memories! Many of us will remember these scenes being played out in our own small towns. Thanks Becky, you've got your ticket! foonoteMaven closes the album cover on this edition of Smile For The Camera with Sticks And Stones Will Break My Back posted at footnoteMaven. Even my husband's ancestors are here to Smile For The Camera. Thank you to everyone who participated in this fantastic 15th Edition of Smile For The Camera and welcome to all the first-time contributors. It is evident from each and every article that a great deal of time, effort, love, and research went into each photographic contribution. As Randy Seaver would say, please take a moment to stop and comment and show your appreciation! The word prompt for the 16th Edition of Smile For The Camera is "Bling, ancestor Bling." I am always drawn to the beautiful jewelry worn by our ancestors in old photographs. The locket that was your Great Grandmother's treasure, the pocket watch proudly displayed by a male ancestor, the beautiful crosses of old, and the children with their tiny bracelets. While not many of our ancestors were wealthy enough to own multiple pieces of jewelry, there was the one good piece that held sentimental value. Some of us have been fortunate enough to inherit those treasures. Show us a photograph of your ancestor wearing their "Bling," or photographs of the pieces you have inherited. Admission is free with every photograph!